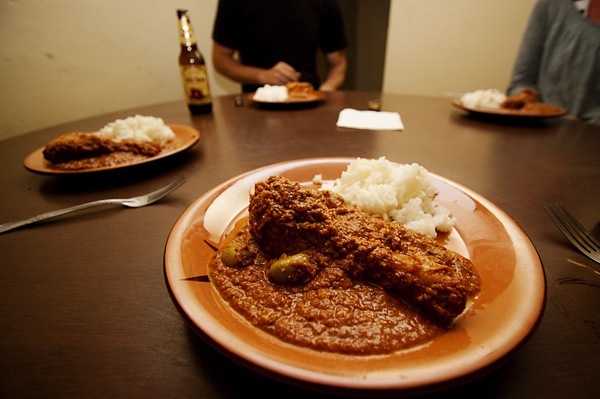 Estofado is one of those dishes that lays bare the connections between the two countries. Estofado tastes like Spain in the interplay between tomatoes, olives, and chicken, which lends the dish a Mediterranean feel. But ultimately the Mexican flavors are the ones that linger; it’s the combination of aromatic, slow-roasted and ground spices that dominates and makes estofado. At some point during the cooking process I was standing over a pan of almonds, raisins, oregano, thyme, cinnamon, black pepper, onion, and garlic, going faint with the hypnotic powers of the smells. The tomato, tomatillo and ancho chile base of the dish keeps the spice combo from becoming too heady. 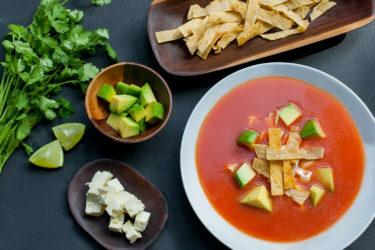 The ancho chiles cut through the acidity of the tomatoes with a dark bitterness, and tomatillos add the slightest kick to the base (avoid using too many, or their sourness will overwhelm the ancho chiles). Sesame seeds give the dish earthy, nutty undertones, providing a solid, one-note foundation for the varied and complex spice paste. Next time, though, I’ll probably use fewer of the sesame seeds. It would’ve helped to have either had more muscle power to really grind them to a paste, or to have had a food processor, since I couldn’t get them ground as finely as the dish requires. This gave the sauce a graininess that I found slightly distracting. It should be smooth and even like a molé. That said, estofado is a show-stopper, grainy or not. Like any molé, it should give you pause with each bite. There are so many layers to it that it takes a moment to piece them all together (unless, of course, you’ve been waiting for two hours for it to cook, in which case you think about the flavors afterwards). I personally love any dish that combines raisins and olives, so estofado won me over from the beginning. But the dish should resonate with anyone who likes Spanish and/or Mexican flavors, combining the best of two continents. To push it more towards the Mediterranean side of things, serve it with a baguette. 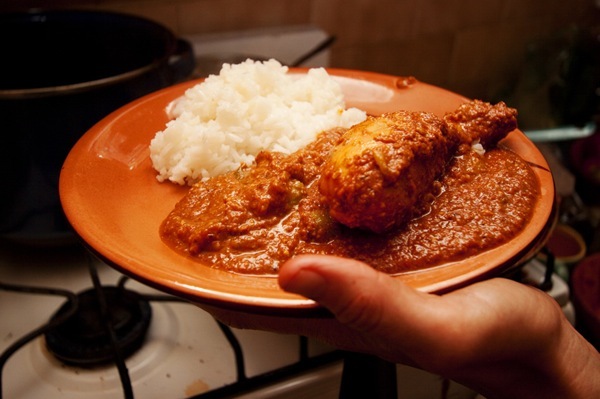 To identify it as Mexican, serve with rice and tortillas for scooping up bites of chicken and sauce. Either way, estofado will take you back and forth across the Atlantic with each bite. Boil the tomatoes and tomatillos until they change color, about 10 minutes. Reserving the water, remove the tomatoes and tomatillos and let cool. When they are cool enough to handle, 10 to 15 minutes later, remove and discard the skins. Toast the ancho chiles in a cast-iron frying pan over medium heat for about 2 minutes on each side, until the skins blister and bubble and they give off their aroma. Remove from the heat and place them in the leftover hot tomato water to soak for 20 minutes. Once they are soft, remove the stems and seeds. Fry the sesame seeds in 1 tablespoon oil over low heat for 10 minutes. Remove, let cool, and grind bit by bit in a spice grinder, food processor or metate. Set aside. In the same frying pan, add 1 tablespoon oil and fry the almonds, raisins, garlic, onion, cloves, cinnamon, peppercorns, oregano and thyme over medium heat until the onion is transparent and your kitchen starts to smell divine. Blend the tomatoes, tomatillos and soaked chiles in a blender with 1 cup of chicken stock. (Divide into two batches if necessary.) Pour the tomato and chile mixture through a food mill or sieve to remove any seeds and the chile skins. Set aside. Blend the almonds, raisins, onion, garlic and seasonings in the blender with 1½ cups chicken stock until smooth (the recipe calls for a blender here, but I would use a food processor. The blender left the spice mix a bit too thick). Heat the remaining 2 tablespoons oil and brown the chicken pieces well, but do not cook them through. The recipe calls for 10 to 15 minutes but I’d cook them a little longer, as they took ages to cook through later in the sauce on low heat. Remove from the pan and set aside. Pour off all but 1½ tablespoons of the oil and fry the tomato and chile mixture with the seasoning mixture over medium heat for 10 minutes, stirring constantly. Add the ground sesame seeds and stir until well incorporated. Return the chicken to the bubbling sauce and continue cooking over low heat, covered, for 20 minutes more. The recipe calls for adding the remaining 1½ cups of stock, but I found it wasn’t necessary as the sauce was already aromatic and well-balanced and would’ve ended up watered down. I’d say eye it, do a taste test, and decide if the sauce needs some thinning out or not. Then add the capers, caper juice and olives. Let the chicken simmer, covered, 15 minutes more.